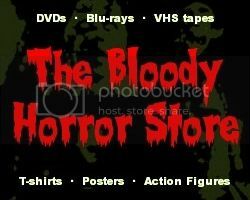 Dr Blood's Video Vault: Puppetmaster/Killjoy - 12 movies for $5! Puppetmaster/Killjoy - 12 movies for $5! I bought this multipack two weeks ago from Wal-mart for only $5, but I don't think that I posted anything about it except on Facebook and Twitter. As you can see from the scan, I haven't even opened it yet so I can't tell you anything about the quality of the transfers or how the movies are arranged on the DVDs. I intended to have a marathon "Puppetmaster" day, but I fell asleep in a big furry heap with Willow (my cat not the kids' movie) instead. It's only the later movies that I haven't seen anyway. A demonic crew of puppets unleash their murderous talents on psychics investigating their owner, Andre Toulon. Toulon's army of assassin puppets exhume their beloved creator to gather the brain matter that keeps them alive, but the Puppet Master has a deadly plan of his own. Blade, Tunneler, Pinhead and the newest head-swapping puppet, Decapitron, go toe-to-toe with their most menacing enemy yet—a team of terrifying gremlin-like creatures. A group of unsuspecting college students accidentally open the portal to Killjoy's demon realm and get trapped in a strange funhouse world with the killer clown and his friends. One thing to beware of if you go to Wal-mart is that they also have a pack of just the 9 "Puppetmaster" movies for the same price, and that's the one which is on the racks rather than in the $5 bin. It's still a good deal if you don't want the "Killjoy" movies, and the artwork is better anyway. I found this pack in the bargain bin at the front of the store and saw that there was also one copy in the regular bargain bin next to the DVD section. I don't think that they are as rare as the Lionsgate multipacks which had everyone on a wild goose chase last year, but don't be surprised if your local Wal-mart doesn't have any left. From the sticker at the top right, it looks like they've had these since March. If you can't find it or don't have a Wal-mart, you can also get this pack from Amazon for $4.99. The best price is coming up as $1.37 right now, but that's without the shipping.